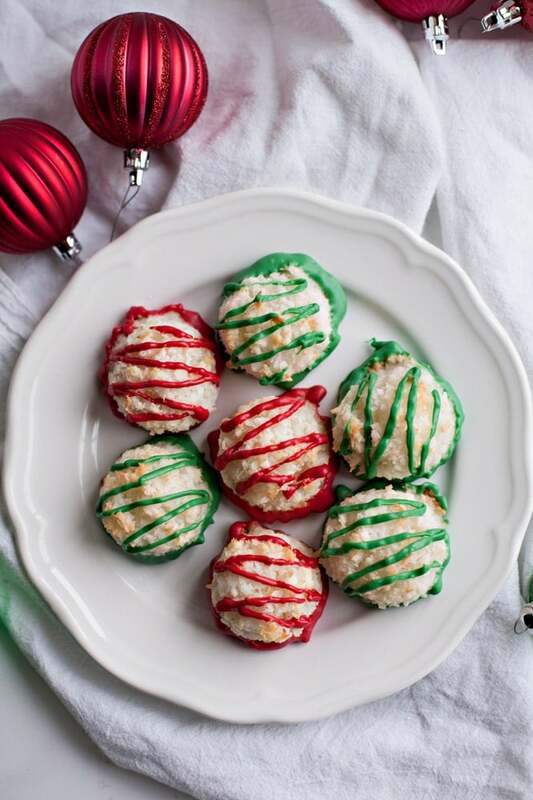 Easy Peppermint Macaroons ~ Only 6 Ingredients in these Festive Cookies Perfect for the Holidays! Use Almond Extract and Chocolate and Make them all Year Long! My kids don’t like coconut. Won’t even touch the stuff. So I’m not sure why my youngest daughter wanted to try a macaroon. We were at Panera Bread, and there was a lovely display of cookies at the front which included macaroons dipped in chocolate. It was probably the chocolate that caught her eye. She’s a little bit obsessed with chocolate. So in the spirit of giving my child important life experiences, I bought her a macaroon. She loved it. When I told her it was made almost entirely of coconut, she vehemently denied that such a thing was possible and insisted that there was no coconut in the cookie. No matter how hard I tried, I could not convince her that she had just eaten coconut. I, on the other hand, love coconut! For instance I can’t get enough of this Lemon Coconut Cake. I love waking knowing I’m going to have yogurt topped with yummy Homemade Tropical Coconut Granola. Bring on the coconut! Since that day, she has reminded me repeatedly that I need to make macaroons (the cookies that DO NOT have coconut) at home. 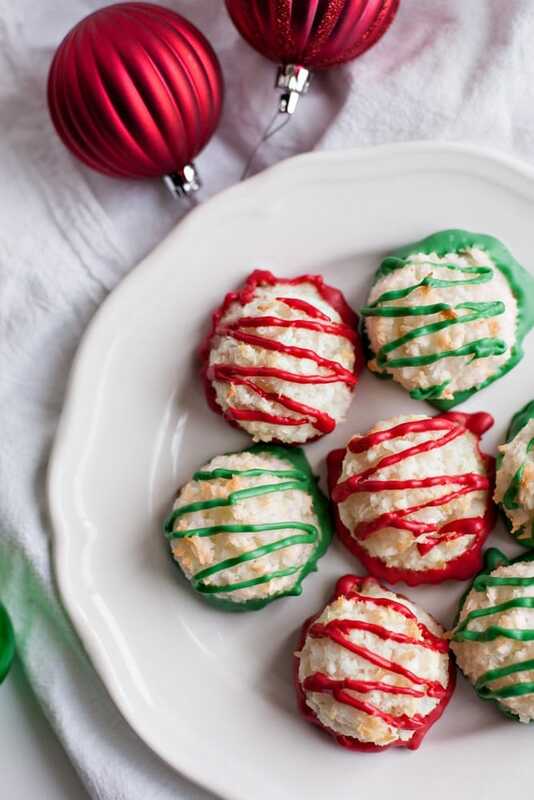 You can imagine her delight when she came home from school one day and found these Christmasy Peppermint Macaroons on the counter. Her eyes got wide and she said something appreciative like, “It’s about time.” Then she ate one. Or two. Or ten. I wasn’t looking. You know what’s weird? She doesn’t like peppermint, either. But there she was, eating cookies made of the hated coconut and peppermint, and loving them! When we got down to the last cookie, I saved it for her (fighting my selfish impulses to eat it myself). Part of me hoped she would have accepted the fact that macaroons are indeed made with copious amounts of coconut and that she would have decided to reject them. Alas, this was not the case, and she readily ate the last cookie. To make these macaroons more festive, I dipped them in red and green vanilla melting chocolate (Wilton’s brand) and drizzled some of the chocolate on top. But this is totally optional. You can also dip them in milk chocolate (dark chocolate is divine with these) or not dip them at all. 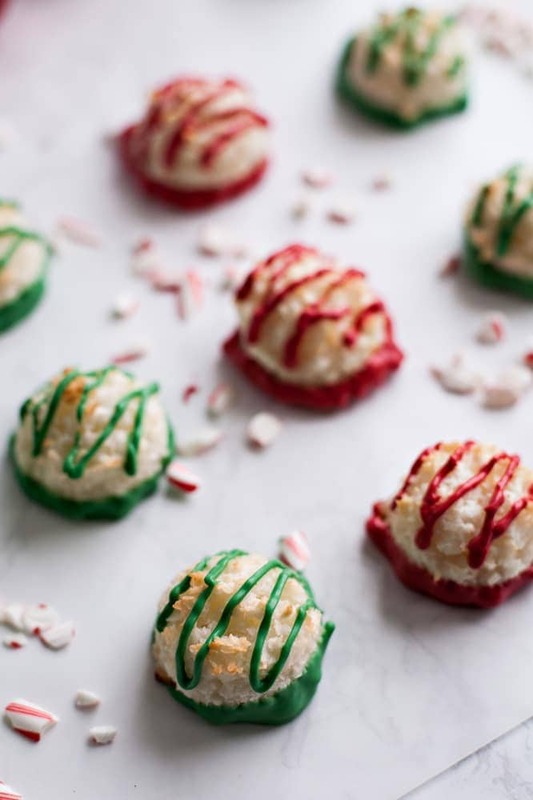 If you don’t like peppermint, you can also leave it out and replace it with almond extract for a more classic macaroon flavor. The best way to make these cookies is with a food processor. This is because you want to chop up your coconut so that it is not long and stringy. Having shorter pieces of coconut will help your cookies hold together better. All you need to do after you’ve chopped your coconut is to add some sugar, vanilla and peppermint extract, and some egg whites. Pulse a few times until the mixture comes together. Then take a large cookie scoop and place the coconut mounds on cookie sheets lined with parchment paper or silicone baking mats. The cookies don’t spread, so there’s no need to space them super far apart on the pan. You’ll just need to bake them for 18-21 minutes, until the bottoms begin to brown and the tops start looking a wee bit toasty. Once you remove them from the oven, you need to let them cool for at least 15 minutes on the cookie sheet before transferring them to a wire rack to cool completely. They need time to set up. Then you can melt some chocolate (any kind) and dip and drizzle to your heart’s content! Use a food processor to chop your coconut! Not a peppermint fan? Use Almond Extract instead of Peppermint Extract. 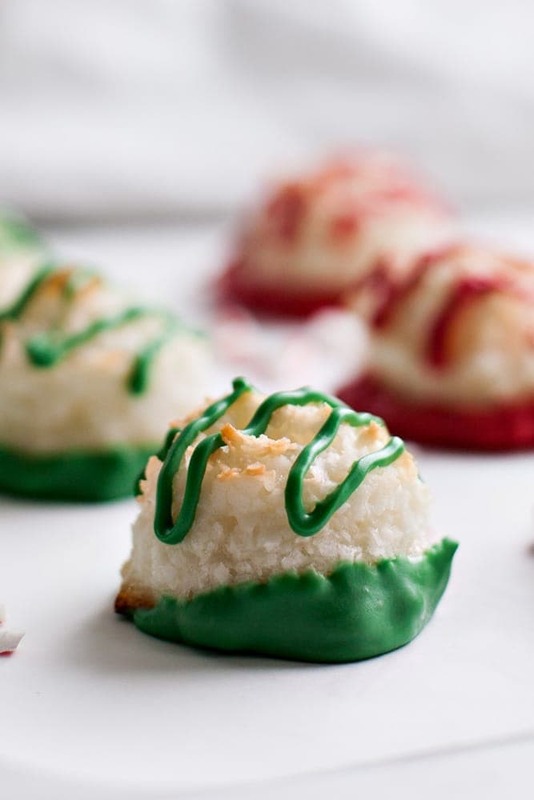 For Christmas use green and red candy melts to dip them in, but if you want to make these year round use chocolate! Line your pans with parchment paper or silicone baking mats for easy clean up. 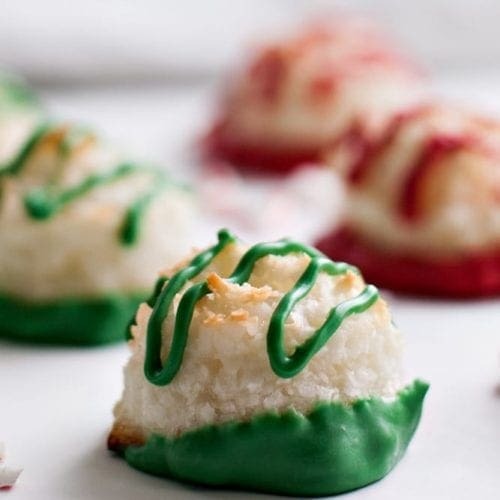 So if you want a tasty treat for Christmas, or if you just want to trick your child into eating some coconut, these Peppermint Macaroons are just the ticket! Another great treat everyone loves during the holiday season is homemade peanut brittle. Be sure to check out my Microwave Peanut Brittle Recipe, it’s a real family favorite! And these Almond Chocolate Meltaways? Heaven in a bite, enjoy! Chop your coconut in a food processor by pulsing it several times. Add the granulated sugar, vanilla extract, and peppermint extract. Pulse until sugar is incorporated. Add the egg whites and pulse until the mixture comes together. Use a spatula to scrape down the sides of the food processor as necessary. Mixture will be very sticky. Using a large cookie scoop, firmly pack the coconut mixture and place on a parchment or silicone-lined cookie sheet. Bake for 18-21 minutes until bottoms and tops begin to brown slightly. Remove from the oven and let rest on the cookie sheets for about 15 minutes, until cookies become more firm. Then transfer to a wire rack to finish cooling completely. Once cookies are cooled, dip the bottoms in melted chocolate and place on parchment paper to let the chocolate harden up. To drizzle chocolate over the top, cut a small hole in the corner of a plastic sandwich bag. Put melted chocolate in the bag and gently squeeze it out of the hole. Am I allowed to comment on my own recipe to reiterate how easy and delicious it is? I bet you could make macaroons with all kinds of different flavors, like orange and strawberry! I love anything coconut! I also love the Kitchen aid mixer giveaway! Peppermint! Anything peppermint is awesome! I would love to make a chocolate cake. I have yet to make a macaroon!! I didn’t realize how easy they were so now I know what cookie I’m making next!! So few ingredients which is always a win! You’ve gotta try them if you like peppermint!